We have two tracks, vocal and instrumental. Below you will find our wide array of course offerings. Each music student at the Baltimore School for the Arts receives one weekly lesson in his or her specialty area. These lessons are taught by our staff of full and part-time faculty. 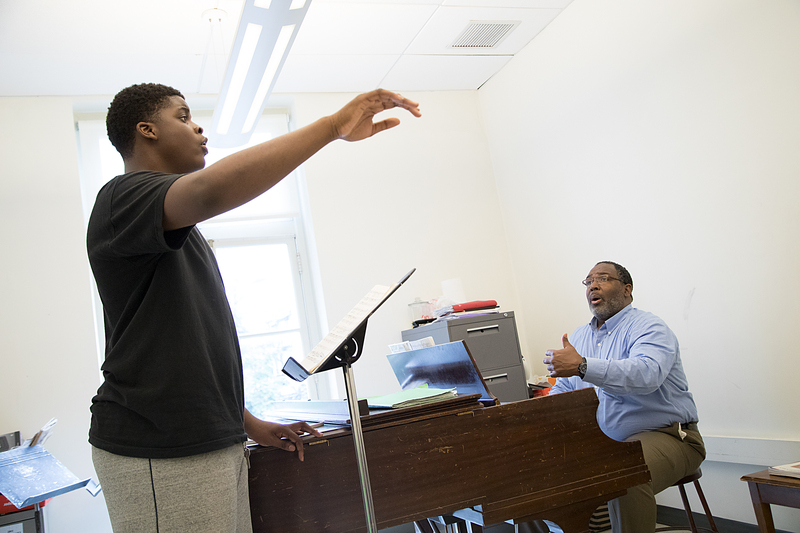 Faculty members include artists who also teach at Peabody and other fine institutions of higher education, as well as performers with the Baltimore Symphony and the Washington Opera. Vocal students should practice for a minimum of 45 minutes per day and instrumentalists should spend a minimum of 2 hours per day preparing lesson material. Private lessons are devoted to developing the basic musical tools to unlock students’ musical talent and prepare them for further study at the finest colleges and conservatories. This course meets three days per week and teaches rudimentary musical literacy. Sight singing and the development of aural skills is heavily emphasized. Rhythmic and melodic dictation is studied. You will also learn the writing of scales, intervals, and triads. Homework, both aural and written, should be expected after each class meeting. This course meets three days each week and continues the development of musical literacy through sight singing of non-modulating melodies, dictation of one and two voice melodies and rhythmic dictation. Written skills include harmonic and melodic analysis, writing triads and seventh chords in inversions, and identifying harmonic and melodic cadences. Music Theory III, a third-year course, provides college-level musical literacy skills. You’ll intensively develop aural skills through sight-singing, melodic and harmonic dictation. Music created and studied involves modulation and advanced harmonic elements such as secondary dominant, augmented sixth, and borrowed chords. Written exercises in contrapuntal and 4-part examples also include these harmonic elements. Formal and harmonic analysis of masterworks is addressed as well. You are expected to spend a minimum of 30 minutes in preparation for each class. Music Theory III meets 5 times per week in 42-minute sessions. You’ll be evaluated through written tests, dictation exams, and sight-singing examinations. Some students opt to take the AP Music Theory examination at the conclusion of this class. Music Theory IV, a fourth-year course, continues the emphasis on aural skills to build a robust, polyphonic, and harmonic musical literacy. This class also prepares students for success in written music theory placement examinations in the college setting. Advanced four-part harmonic writing is explored in the forms of written examples and dictation exercises. You’ll perform close theoretical analysis of music in your current performance repertoire. This analysis is presented to the class in written and verbal form. You will be expected to spend a minimum of 30 minutes in preparation for each class. Music Theory III meets 3 times per week in 42-minute sessions. You will be evaluated through written tests, dictation exams and sight-singing examinations. Most students opt to take the AP Music Theory examination at the conclusion of this class. Students in Digital Music (a fourth-year course) use digital technology to explore the creation of original music. You’ll become proficient in using various software packages (ProTools, Ableton Live, Finale, Sibelius, Adobe Creative Suite). You will use these tools to create and record music for concert, dance, and video applications. You will be in class for three 42-minute periods per week and are evaluated on both technical proficiency with digital tools and creative ability in creating original music. You will be expected to spend a minimum of 30 minutes per class in preparation in the CCAT studio. Keyboard I is offered to voice students and it meets five days per week, with three days of instruction and two days of practice. This course teaches elementary keyboard skills for those with little or no prior keyboard background. Scales, chords, and simple piano repertoire are taught. Practice at home is required. Keyboard II is offered to voice students and it meets three days per week and includes transposition, intermediate piano repertoire, and harmonization of melodies. These keyboard classes meet once per week and are offered to first-year instrumentalists. This class teaches basic keyboard skills for those with little or no prior keyboard background. Scales, chords. An introduction to active music listening, Music Literature I meets twice each week. The course begins with the elements of music (melody, harmony, meter, dynamics, etc). Form is introduced in its most basic application. A survey of art song, opera, symphonic music, and chamber music concludes this course. Study of class notes and listening to class recordings is required. This course meets twice per week. It is a chronological survey of Western music from 1500 to the present. Emphasis is placed on the historical development of musical styles. Score reading, transportation, and analysis are introduced. Vocal Diction and Repertoire consists of a four-year cycle of courses meeting four times per week. The first year focuses on English diction and simple song repertoire. The International Phonetic Alphabet is introduced and special problems relating to sung English are studied. The second year covers Italian pronunciation and Italian art song. The third year covers German pronunciation and Leider. German poetry and its pronunciation are also studied. The fourth year covers French pronunciation and chanson. The music is placed in its historical context and poetry is studied. These classes are for students studying string instruments, winds, brass, percussion, guitar, harp, and piano. They are intended to give you an opportunity to work on your solo performing skills as well as an opportunity to discuss and build on advancing techniques. Projects on etudes and scales will be included. Classes are directed by faculty members. All music students participate in chorus. Chorus will provide you the opportunity to engage your imagination in the production of music without intervening instruments. The chorus performs masterworks of the repertoire in several concerts per year. Solfege, harmonic analysis, and vocal production skills are applied to real-world performance practice. The orchestra has a schedule of two periods of rehearsal per week, including sectional rehearsals. Several concerts per year are prepared including choral concerts, a concerto concert and other special events. This ensemble meets four periods per week and focuses on string orchestral repertoire. This ensemble introduces wind players to large ensemble performance. Individual musical responsibility is emphasized. Rhythm, tuning, and stylistic performance practice are studied. The big band introduces jazz players to jazz style, improvisation and ensemble techniques. Wind, strings, brass, and piano players study masterworks of this literature. Ensemble rehearsal and analysis techniques are emphasized. The Chamber Chorus consists of junior and senior vocal majors. Music of a more advanced nature is studied, as well as smaller scale choral works. This ensemble has frequent performances and a large repertoire. This ensemble performs jazz standards in a quartet to septet format. Improvisation is emphasized. The Percussion Ensemble deals with contemporary music for percussion. Mallet and tuned percussion is often emphasized.